kleinbl00 · 644 days ago · link · · parent · post: New to Hubski? Old to Hubski? Can't post? Come on in, let's discuss. I so don't trust mk's color choices. And besides, people who follow you are already green. Just let me build my own stylesheet, fer chrissake. Let me pick colors and fonts and background and we'll call it a day. I thought it would just color the promote link, not their name. Yellow is a good in-between for the existing green and blue (given the color wheel). Asphalt and chewing gum is a small price to pay for the brighter alternatives. And we kid a lot but clearly, stylesheets are deeply personal. work for you guys? I'm open for taking input and critique. 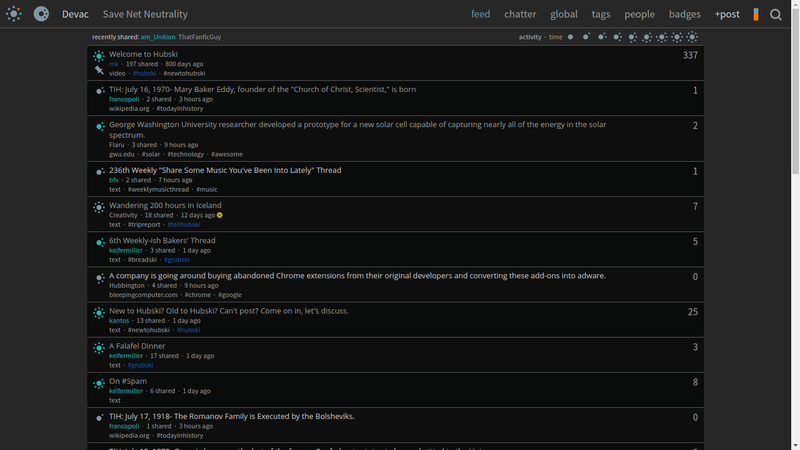 This is just a quick and dirty modification of the dark theme. Well, it wouldn't be the first time when I attempt to do something against my better judgement. That alongside the font used for d20 is how I imagined it. 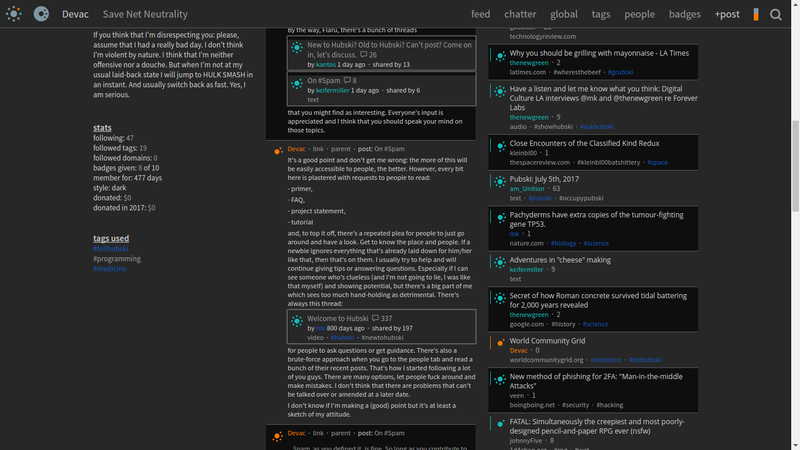 Not sure if you use dark by default, yet the fonts, spacings and palettes as you know differ. On the side of kb, pretty sure he thinks dark mode is dirty enough, if ya smell what I'm farting. The customisation bit isn't out of the question, though. An extension like Stylish allows you to choose the details like fonts from a menu (and I think that there's a convenient spectrum to pick the colours so that you don't have to speak hexadecimal to set them). I can try and cook something like that and post it on the Userstyles page later this week.